The annual festival takes place in the month of March at the Mylapore Kapaleeshwarar temple. The highlights of this very prestigious temple festival are the Thiru Ther (temple chariot) and the Arubathu Moovar day, when the divinity of the aura around Mylapore multiplies with the 63 Nayanars being carried around in a procession in colourful palanquins. Thousands of people come from all over and outside Chennai to behold the Arubathu Moovars. 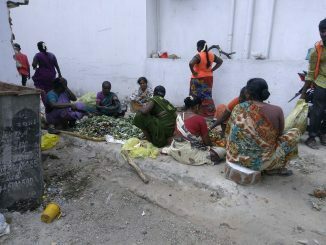 Another highlight of this festival is large scale Annadhanam (distribution of food) by vendors and residents. The Annadhanam takes place not only around the temple Mada veedis (main streets in the temple square) but also in almost every street of Mylapore. While the intention behind this is very noble indeed, it has also led to large scale food wastage in the past few years and massive littering of the area during the festival. Walking down the streets after the festival would mean walking past mountains of food waste, disposable plates and plastic cups strewn all around the area. The clean-up task after the Arubathu Moovar day has been a mammoth task for the conservancy staff of the Greater Chennai Corporation and volunteers. The Kapaleecharam volunteer group is a People’s Federation whose mission is to make the Mada streets litter-free, eco-friendly and pedestrian-friendly. 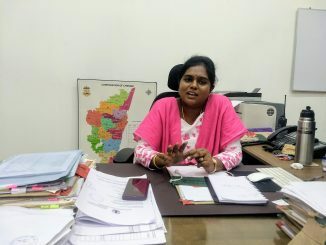 Last year in an attempt to reduce food wastage and littering, this group organised multiple meetings with the Chennai Police and GCC, requesting their planning and logistical support. 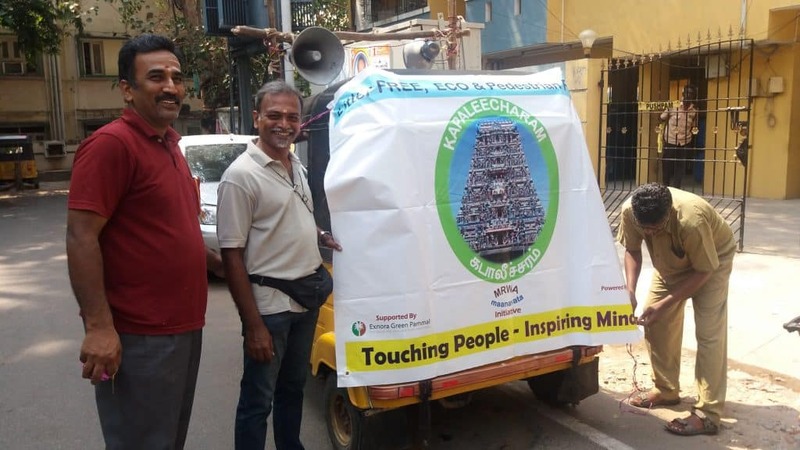 One of the novel ideas they used, was an autorickshaw that went around all the streets of Mylapore, Mandeveli and Raja Annamalaipuram, playing lively Kapaleecharam Thooimai (cleanliness) songs. The songs, and the announcements in Tamil that followed, sent out strong messages to the public, requesting them to avoid food wastage and throw garbage only in designated bins. The messages also exhorted vendors and annadhanam donors to avoid thermocol and plastic disposables during the festival. The auto will ply once again in these areas during the festival days – March 22nd to 30th. Volunteers organized themselves into groups, met various donors before the festival and requested them to follow guidelines. On the day of the Arubathu Moovar festival the volunteers went around the Mada veedis requesting the devotees to dispose the plates in garbage bins and donors to regulate the quantity of food. Many volunteers went on to start cleaning the littered areas themselves. the festival. One major problem faced last year was the shortage of garbage bins to hold the plates and cups, causing a major bottleneck for the volunteers. The numbers have been increased significantly for this year. Various initiatives have been planned to spread awareness through walks and posters, and arrangements are being made for garbage collection bags/bin at regular intervals. Volunteer groups from all over the city have been invited to join hands to help organize a Zero waste, litter free Arubathu Moovar. Food and Water should be distributed only in eco-friendly paper plates/banana leaves/paper cups. 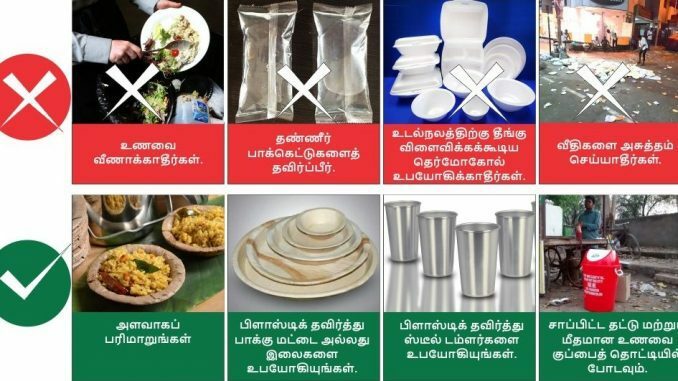 Avoid Thermocol/Plastics/Polystyrene plates or cups for any kind of distribution. Used plates and cups should be disposed only in Garbage bins/bags provided at various points. Limit the quantity of food served in plates to avoid wastage of food. Keep the area around the Annadhanam counter clean and request devotees to eat and dispose of the plates/cups in the bins at the counter itself. All devotees are requested to cooperate and maintain the cleanliness and sanctity of the Mada veedis during the festival. What are the mandatory fields in the self declaration form? How can NRIs submit the form? 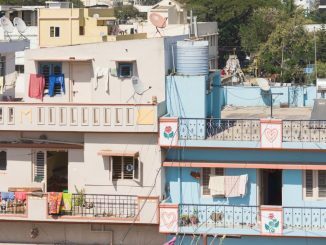 Do you pay property tax even when your plot is empty? These and other common questions among readers answered by the Deputy Commissioner of the Corporation Revenue Department. The need of the hour to prevent food waste and littering the public space during such festival with huge attendance of devotees from across the city and nearby districts. Good intitative. Apart from this providing mobile toilets to be provided suffiently at accessible points without polluting the space has to be considered.